Excellent ! Worked for me too. Thanks Lewis - I can go and watch the Hollinsclough clip now too. The vids were taken at manton quarry in lincolnshire. It seems to go well, have you turbo'd it now? It was always turbo'd Lewis, the semi electronic pump on the mondeo engine always held it back, i have fitted a 300tdi injection pump to the ford engine now and it has really transformed the engine. I don't think the sliding a frame make a blind bit of difference to the way it climbs, i posted the clips for DeRanged and to try and make sense of why the high AS/AD works for me. Aggressive driving too, yourself or someone else? Both clips are Johnny, the agressive approach was the only was to get a clear on that section, he was the only person to clear it, i'd tried to finesse it and only got a 1. I fully intended to take some more comparison clips on the setting up day, but it was getting colder and darker and beer was calling! I'm pretty sure it does squat under power, which is the opposite of what the AS% says it should? I have posed the following question previously on other forum discussions without receiving an answer. If the front radius arms chassis attachments happen to be behind the vehicles for/aft centre of gravity, do anti dive forces due to braking tend to lift both front and rear ends, instead of just the front? And conversely if the rear radius arm chassis attachments are in front of the for/aft COG, do antisquat forces tend to lift the whole chassis on steep climbs instead of just jacking the back end ? Providing traction was maintained on both front and rear axles, I'd assume these opposing forces would counter each other to a degree. But what happens on a steep gradient when front end traction is marginal and rear end traction is high? The rear RA's lifting the whole chassis would presumably be lifting the COG, leading to a possible rear endover flip. It would be a little more difficult to arrange radius arms or One Links etc in this way on a vehicle with a longish wheelbase, but on something like a Suzuki or even a SWB LandRover, one could get close. Bill, the important thing is the path of the line from the tyre contact patch through the side view instant centre (SVIC). So you must consider both the height and for & aft position of the SVIC, i.e. don't consider one in isolation. Now plot that line and see where it passes the sprung C of G, more importantly how close/far it is from the sprung C of G and on which side. I can't see the clips, Photobucket gives a message that this is temporary. %AS numbers are only as good as the data values used to determine them, and the height of the sprung C of G can often be a wild guess that introduces significant errors. Your statement about using the %AS to compare what works well for you with one build and use it again with another build for similar/same use is spot on. This is also valid for using the same %AS as someone else if it works well in the same circumstances. What is not valid is taking values that work well for completely different terrain and traction conditions and expecting them to be ideal in all conditions. So it is a meaningful measure when used appropriately. Hills don't change the C of G or wheel base. You are making the mistake of not changing your reference frame with the slope if you think that, and you are probably getting %AS wrong if you haven't adjusted the reference frame. The change is suspension height, front and rear does change on hills (and with articulation) and that may, or may not, change the position of the SVIC, relative to the tyre contact patch. In a 2wd vehicle the %AS doesn't change on hills. In a 4wd vehicle it does because the traction, front and rear, changes. We have squat at the rear wheels, and its opposite, lift at the front (%anti-squat and % anti-lift (for a 4wd only) are calculated the same way, but the proportion between rear and front traction needs to be taken into account for a 4wd, similar as for braking). Link suspension has an advantage over radius arms in that there is more freedom in where to locate the SVIC, it can even be where there is an empty space. Another big advantage, assuming there is nothing in the way, is they can allow the %AS to reduce when the suspension rides, thus creating a more stable system vs unstable system if the %AS rises. For %AS, radius arms will behave the same as link suspension with the same SVIC, and vice versa at a particular suspension height. Compared to radius arms, link suspension allow more freedom to adjust the roll axis. However there are more ways to get link suspension wrong compared to radius arms. Don't judge either link or radius arm suspension by comparing a good example of one to a poor example of the other. 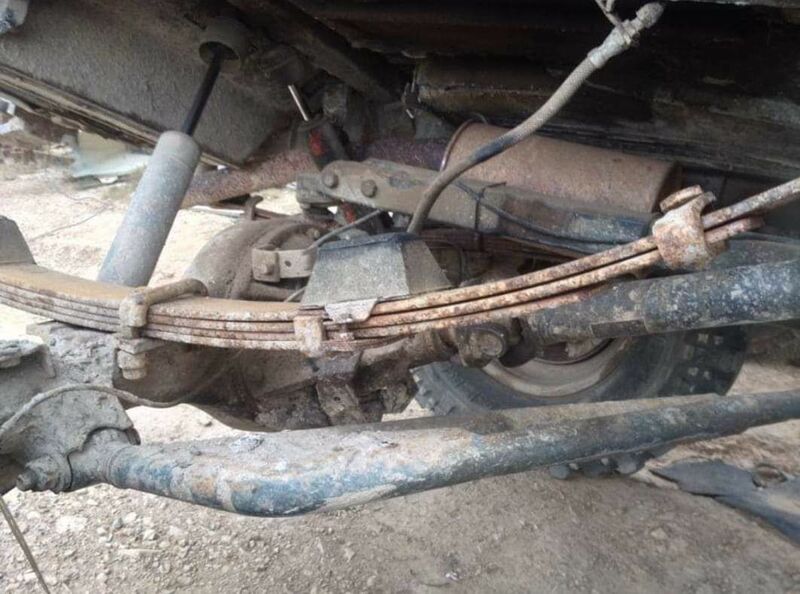 Also remember good link/radius arm suspension can be let down by poor springs or dampers. The clips seem to be working ok. Although the wild guess of CofG can introduce significant errors in the actual numbers, the actual percentage differance between the front and rear should remain fairly constant for any given change in CofG hieght. Dan, how did you determine the cog position, height and forward/rear? Is the seat a long way behind the centre line? Or is the vehicle that light/you that heavy that it makes such a difference to weight distribution? Combination of both Lewis, it only weighs 865kg i wiegh in and around 100kg, and the seat is halway between the centerline of the wheelbase and the rear axle. It's light enough that i can tell it climbs worse with a adult passenger on board! The front to rear weight distribution directly affects the fore & aft position of the C of G. By definition C of G is a notional point where a concentrated mass equal to the total mass will produce the same effect. For equilibrium the sum of all of the moments must equal zero. The above is an example finding C of G give 2 known weight/masses. The method for finding the C of G for a large number of masses is the same i.e. add the moments for all of the masses, then divide by the total mass. But if you are going to consider anti-lift with a 4wd, then you should not be using the usual 2wd theory to determine %AS. John I have been asking on a few forums over the years, if we still calc the anti's for our rigs given that the book stuff is all based on solid axle 2wd. Are you saying that our values are changed by 4wd and that both axles are driving and housings reacting? I don't see a problem using the 2WD method to compare behavior, when comparing apples with apples, so to speak. If you want to be pedantic the %AS, %AD method/value are easily adjusted for 4WD, but when your being pedantic, what do you do when you reach the limit of traction at the front? Get the co driver to sit on the bull bar? More than five years after this excellent build...what can be said? Any problem/things to do different if done again? I think that a mix of this and Bill's Wildfing rear one link on leafs will give what I want for my 88. Sadly not seen him around these parts for a long time! He spends time on Instagram I believe.